When I first saw this bag, I immediately thought Chanel Cocoon. Ok, so it may not be Chanel, but it still has its high points that can give the Cocoon a run for its money. I love how big and soft this bag is plus it has some nice practical zippered pockets on each side. It's made of buttery nappa leather and the unstructured handles feel really comfortable sitting on my arms. Although the bag is a little large for my daily use, I'm pretty sure I'll be bringing it along on my New Year's trip. 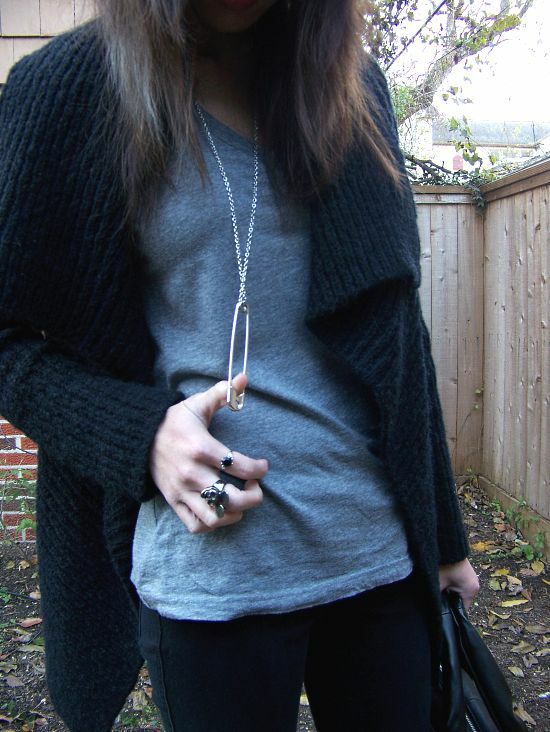 The large safety pin necklace was something I saw on a blog once. I remembered that I had a large metal safety pin lying around in my drawers from an old skirt. Switched it out with another pendant on a long silver chain and viola! a new whimsical necklace. I'm having issues with the safety pin lying down properly but what the hey, no biggie. Oh yeah, my hair is now a lighter shade of brown. Unfortunately, the box dye turned my blonde strip gray. I can just claim that I'm trying out the new gray-haired trend. :} Yeah, I didn't think it would work either. 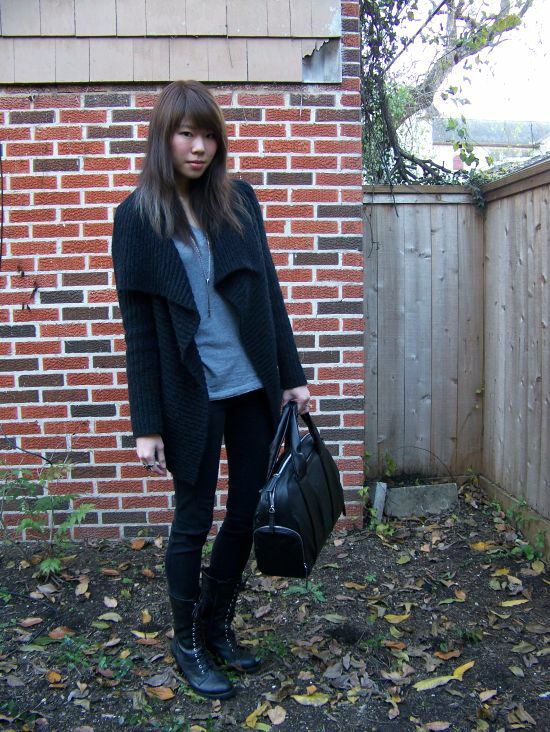 Awesome cardigan and boots. Too bad about the gray-hair; it doesn't look too bad. Not really noticeable, you know. Thanks Rebecca. I think it's going to be okay. For some reason, the box dyes never hold onto the salon dyes (the blonde part). With a few more washings, the blonde will completely show through. I love that look, that's so pretty for winter or fall :) Your boots are awesome!